To the Thiruvananthapuram City Vocational Higher Secondary School where a class teacher once caught 3 inebriated backbenchers, where young lady teachers hesitated to engage the class, where the teachers were threatened with dire consequences by gooda elements at the instigation of students, where a teacher had to hide in the staff room as the parents outside the gate threatened to finish him off, where the underworld elements used to hide their weapons in the trees of the compound and where the percentage pass was a miserable 0, to such an institution when Marikutty was appointed as the principal, all her well wishers advised her against taking up the assignment. She heard their arguments with a smile but insisted that such a school deserved an attempt to make it better. After lengthy discussions with the teachers, she made the first move to secure the school buildings by fixing stronger doors and windows. Attempts were then made to diffuse students� quarrels, which used to be fanned into infernos by vested elements outside. As a natural consequence, she had to face opposition and petitions. However, slowly, the parents came to appreciate the moves of the teachers to enforce discipline in the campus. But the goons and their masters threatened to transfer her and or even eliminate her. But she was unperturbed. Towards building brotherhood among students, the school celebrated Onam and served a feast. After clearing the school ground, the students started an agricultural farm. Teachers shared a part of their income and provided food, books and uniform to the economically weak students, who formed the majority. Extra classes in the evenings were conducted for slow learners. There were even occasions when the teachers hired autorickshaws and went to the students� homes to bring them for exams. Such effort did not go in vain. That year 24 students appeared for SSLC. 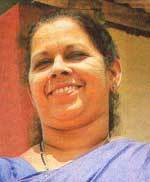 When the results came, Marykutty�s eyes filled with tears. For the school had scored 100% pass.